Home > Pennsylvania > Knoebels > Skloosh! Good Hopkins shoot-the-chute. The viking by the entrance looked good and this usually is a walk-on. This one had a pretty good drop as it was fast and thanks to a nearby branch, it had a great headchopper as well. As usual, I came off completely drenched thanks to the colossal splash. The Skloosh is a ride that will get you wet. If you are looking for a thrill, or a long ride, this isnt it. If you want to be wet from head to toe and everything between, stand on the observation deck after your ride. Skloosh! is a very average shoot-the-chutes ride, but it does get rides EXTREMELY soaked. I didnt find the ride itself to be very thrilling, as I have been on Tidal Force at Hersheypark, which is much larger and more intense. However, Skloosh keeps in nicely with the classic feel of Knoebels, so it works. A nice little boat ride to beat the heat!! It's more fun at night because the lights of the rides aroung it shine on the wave as it hits. The location is great for this reason. Besides the swimming pool, this is the best ride for hot days (I know the swimming pool isnt a ride). All I can say about the ride is: get ready to get wet! If you like water rides, youll love this ride. If you dont, head for the Phoenix and dont waste your time! Sklooosh! is a fun O.D. Hopkins shoot the chute ride that is an excellent ride on a hot day because you get drenched. Located to the left of the park entrance at the front of the park, Sklooosh! is surrounded by some trees. 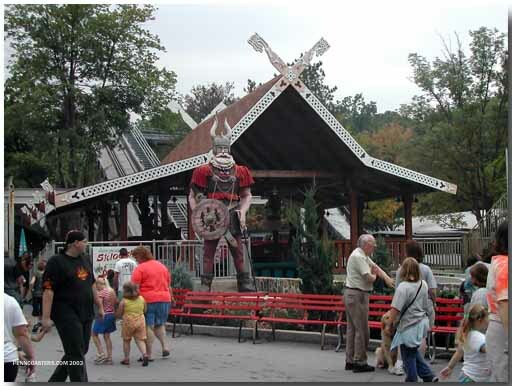 With the basic shoot the chute layout, this one has a giant viking statue at the main entrance. Generally a walk-on because of its good capacity, Sklooosh! has 2 boats each seating up to 20 riders. There are 5 rows each seating 4 riders. My favorite row is the front because of the view. Sklooosh! has a red boat and a blue boat. Once Sklooosh begins, the boat slowly climbs up the 50ft lift hill next to trees. Once at the top, the boat approaches the drop and goes around a right-hand U-turn. You then plunge down the steep 50ft drop with a head-chopper during the drop. A branch from a nearby tree sticks over the drop. At the bottom Sklooosh!s boat makes a massive splash thats just as tall as the ride soaking riders on the ride and guests on a bridge after the ride. You then slowly return to the station ending the ride. After the ride I stood on the bridge and got soaked by the splash the boat after mine made. I got wetter on the bridge than on the ride. Overall, an excellent way to cool off on a hot day. 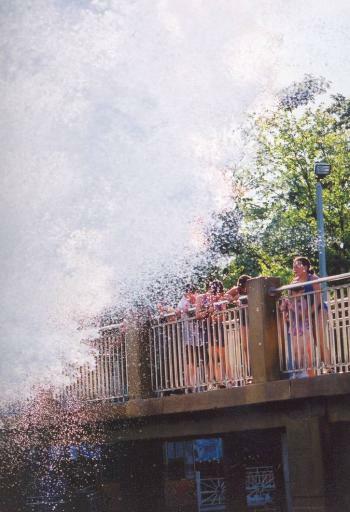 Anyone who enjoys water rides or shoot the chutes shouldnt miss Sklooosh! Typical shoot the chutes ride. You get wet on the ride and soaked on the bridge. Its a good way to cool off on a hot day in the summer. Pretty cool... Ive always had a passion for these rides, and theres a huge headchopper with the tree on the drop. You get SOAKED on the bridge, but only wet on the ride. A very wet ride!!! You will get soaked, good after a long hot day at Knoebels. Standing on the bridge gets you even wetter! A great water ride. Good "shoot the chute" ride. And you can also stand on an obsevation deck and get wet on that, too.